In this outstanding edition of the Bible, the stories of the Old and New Testaments are retold by Selina Hastings in a lucid, flowing style for children's enjoyment and edification. Hastings consulted with a cadre of educators, scholars, and religious advisors to retain the original feel and poetry of the Bible, while appealing to contemporary young readers with clear, lively language. The somewhat lackluster illustrations on every page are not nearly as compelling as the stories themselves, but the variety of other artwork, including maps and color photographs of artifacts, plants, biblical places, animals, people, and architecture, makes up for any deficit there. All the best-known parables and teachings are here, including "The Plagues of Egypt," "The Birth of Jesus," "Jacob's Ladder," "Noah's Ark," "Judas Plots to Betray Jesus," and "The Resurrection," among many others. This volume also includes a "Who's Who in the Bible Stories" as well as quotations from the King James Bible, identified by chapter and verse. 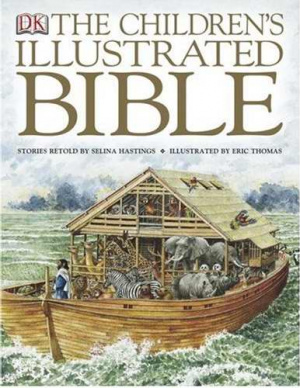 Childrens Illustrated Bible by Hastings Selina was published by DK Publishing in February 2004 and is our 26722nd best seller. The ISBN for Childrens Illustrated Bible is 9780756602611. Be the first to review Childrens Illustrated Bible! Got a question? No problem! Just click here to ask us about Childrens Illustrated Bible. I understand that this book has been published in a pocket sized version and a full sized version. Is this the full sized version? Can you provide me with the book dimensions please? I do not want to purchase the small version as I understand that the print size is too small to be easily read.